Thierry Henry has recruited an Arsenal coach to join him as he begins his reigns as Monaco manager. Henry was named manager of his former side this morning. Henry takes the reigns from Leonardo Jardim who was sacked by the club on Thursday, Henry has signed a deal until June 2021. Henry will be joined by Arsenal under-18 coach Patrick Kwame Ampadu, Ampadu has worked in the youth ranks at Arsenal since 2012. 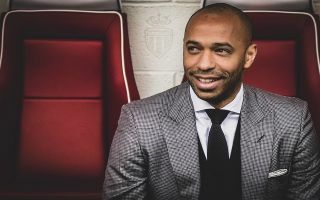 41-year-old Henry started his professional career at Monaco, helping his boyhood club win the Ligue 1 title in 1997 before moving to Juventus the following year. Henry only played in Italy for one year before Arsene Wenger brought the Frenchman to Arsenal and the rest is history. Henry won two Premier League titles and two FA Cup’s during his time in North London before moving to Barcelona. Henry had been working as coach of the Belgium national team alongside Roberto Martinez prior to taking his first step into management.